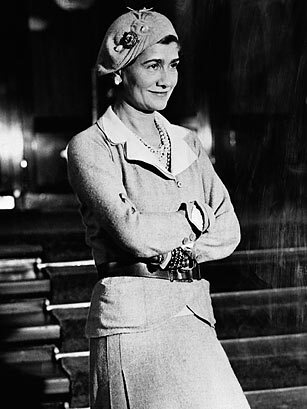 Coco Chanel revolutionized women's fashion in the early 20th century by introducing a looser, more comfortable silhouette that freed women from the corsets and frills that then dominated the apparel industry. Born into poverty in Saumur, France, Chanel worked as a cabaret singer before opening a hat shop in 1910 with the financial backing of a lover. She soon turned her attention to clothing and became the first designer to create with jersey  a cheap fabric used in men's underwear at the time  and bring a menswear aesthetic to women's clothing. Chanel's tweed blazer and skirt, two-toned ballet flat, little black dress, costume jewelry and quilted bag with chain strap remain staples in the fashion pantheon, and contemporary labels introduce reiterations of them season after season. In 1923, she launched Chanel No. 5, marking the first time a fashion designer had forayed into fragrance. She closed her shops at the beginning of World War II in 1939 and did not return to fashion until 1954, when she debuted bell-bottoms. Chanel died in 1971; Karl Lagerfeld has served as head designer of the house since 1983. See more on Coco Chanel's legacy.